Another week has gone by, and that means another version of the Dev Diary Digest! It's a bit late this time around, but hopefully you won't hold that against me. This week was a quiet one full of mostly back-end changes - a better collision system, lots of bug fixes, and other things of that nature. There are just 2 weeks left before the last pre-alpha demo is released on July 9th, so it's been a balance between cramming in as much new content as I can while also making sure it's not a jumbled technical mess. Still, I do have a few things to share! I spent a fair amount of time this week re-iterating over a few buildings in the village as well as creating new ones. 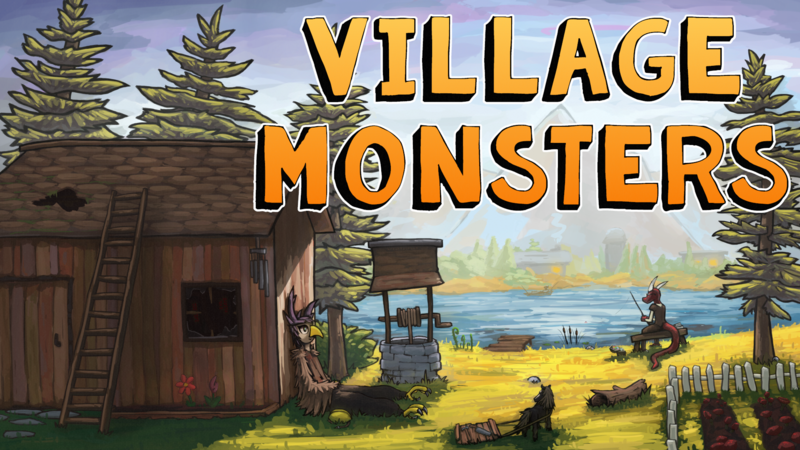 This'll be part of the overarching narrative, but the monsters didn't actually create the village in the eponymous Village Monsters - they found it. As such, the overall design goal of the village itself is a mishmash of re-purposed buildings + new buildings the monsters created. In the above gif you can see a church, a log cabin built by a Harpy-turned-carpenter, and the ramshackle town hall. I've also been slowly but surely adding more and more furniture to the game. Another design goal is to have it so that every furniture piece has some way to interact with it, even if it's very small like spinning the globe. Finally, after some feedback from last week I've decided to add some basic idle animations to the villagers. Because everything is so in flux I don't want to spend too much time animating something that I might need to scrap and redo entirely, but I figure a little bit of animation is better than no animation at all.